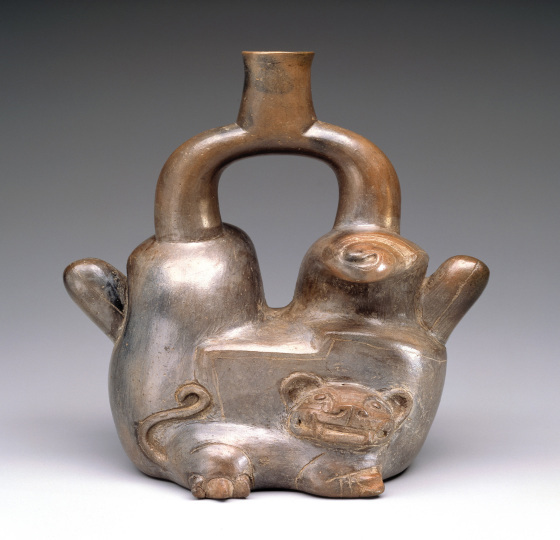 The ceramics of northern Peru are distinguished by their stirrup-shaped spouts, sculptural forms, and monochromatic gray-black color. The vessels associated with the Cupisnique culture often have a highly burnished surface. 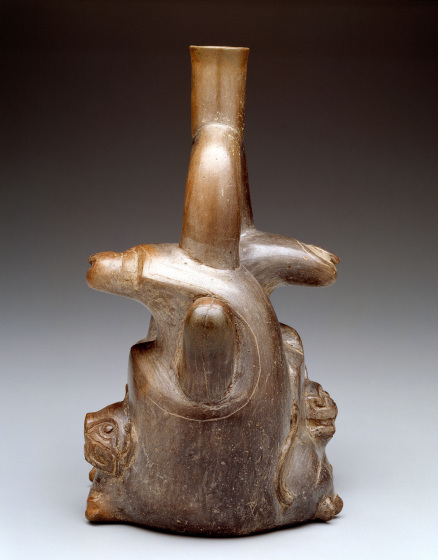 On one side of this handsome vessel, a reclining jaguar faces the viewer; on the other it turns to face its tail. A step-spiral landscape form surrounds each feline and curves around the projecting column of a four-ribbed cactus. Known as San Pedro, this cactus contains the active alkaloid mescaline, which shamanic folk healers of Peru use today in curing ceremonies. San Pedro is a sacred medicine, potent in itself, but made stronger by association with the powers of animals, spirits, and supernatural beings. 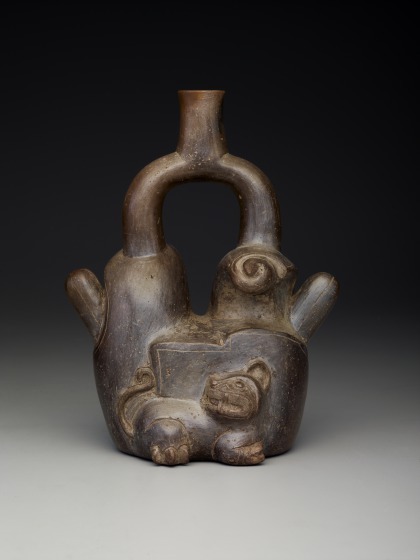 The adaptation of the feline and plant forms to the globular shape of the vessel shows the mastery of the potter over the clay. 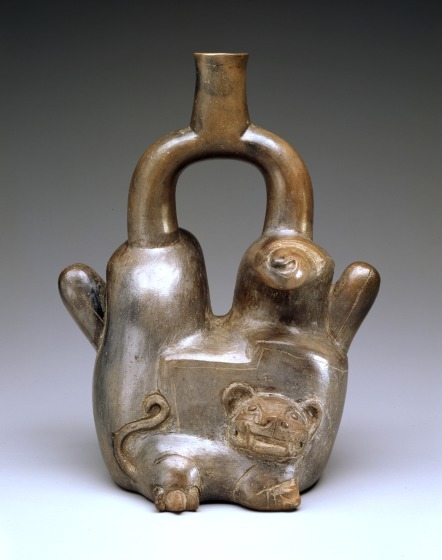 Bonnie Pitman, ed., "Stirrup-spout vessel depicting felines and cacti (1976.W.62)," in Dallas Museum of Art: A Guide to the Collection (New Haven, CT: Yale University Press, 2012), 23. The four-ribbed cactus depicted on this vessel is classified as Trichocereus pachanoi, a spineless columnar cactus of the Cereus family; its common names include San Pedro and Huachuma. It contains the active alkaloid mescaline, used today in curing ceremonies. Most San Pedro cacti have seven ribs; those with four are quite rare and are prized for their potency and exceptional healing properties. San Pedro is a sacred medicine, powerful in itself, but made stronger by association with the powers of animals, spirits, and supernatural beings. 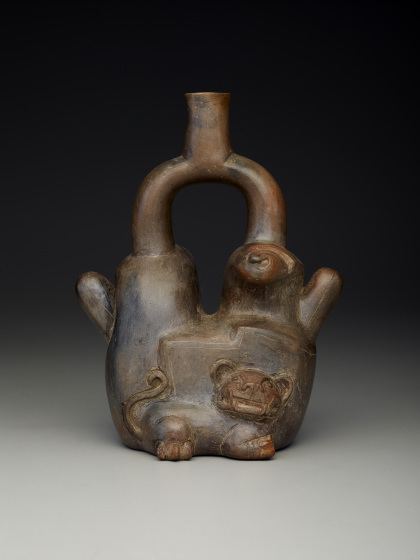 Felines, especially jaguars, signify power throughout ancient Mesoamerica and the Andes.